In a previous blog post, I described using XmlNodePrinter to present XML parsed with XmlParser in a nice format to standard output, as a Java String, and in a new file. Because XmlNodePrinter works withgroovy.util.Node instances, it works well with XmlParser, but doesn't work so well with XmlSlurper becauseXmlSlurper deals with instances of groovy.util.slurpersupport.GPathResult rather than instances ofgroovy.util.Node. This post looks at how groovy.xml.XmlUtil can be used to present GPathResultobjects that results from slurping XML to standard output, as a Java String, and to a new file. This post's first code listing demonstrates slurping XML with XmlSlurper and writing the slurpedGPathResult to standard output using XmlUtil's serialize(GPathResult, OutputStream) method and theSystem.out handle. // XML content out to standard output. println "USAGE: groovy slurpAndPrint.xml <xmlFile>"
The next code listing demonstrates use of XmlUtil's serialize(GPathResult) method to serialize theGPathResult to a Java String. // write the XML content to a String. The third code listing demonstrates use of XmlUtil's serialize(GPathResult, Writer) method to write theGPathResult representing the slurped XML to a file via a FileWriter instance. // the file to which the XML should be saved/written. 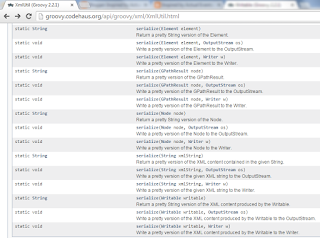 println "USAGE: groovy slurpAndSaveXml.groovy <xmlFile> <outputFile>"
The examples in this post have demonstrated writing/serializing XML slurped into GPathResult objects through the use of XmlUtil methods. 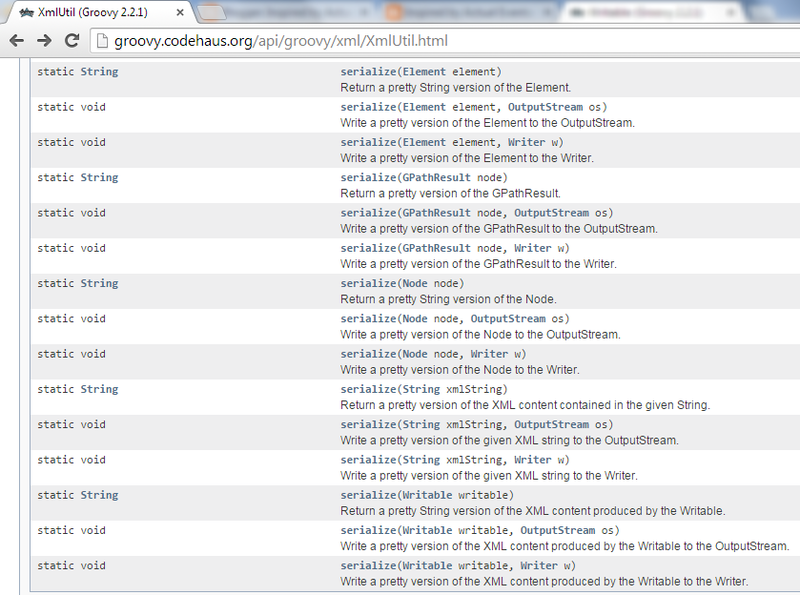 The XmlUtil class also provides methods for serializing thegroovy.util.Node instances that XmlParser provides. The three methods accepting an instance of Nodeare similar to the three methods above for instances of GPathResult. Similarly, other methods of XmlUtilprovide similar support for XML represented as instances of org.w3c.dom.Element, Java String, andgroovy.lang.Writable. The XmlNodePrinter class covered in my previous blog post can be used to serialize XmlParser's parsed XML represented as a Node. The XmlUtil class also can be used to serialize XmlParser's parsed XML represented as a Node but offers the additional advantage of being able to serialize XmlSlurper's slurped XML represented as a GPathResult.